Living with diabetes doesn’t have to mean living in a prison. You can have a happy, healthy life as long as you control diabetes through careful management techniques. Here are some of the tips that will help you manage your diabetes. Test your blood glucose regularly, as recommended by your health care provider. Test your blood glucose more often when you’re sick. Record your blood glucose test results in a record keeping log. Bring your log book with you to all of your doctor’s visits. Keep your scheduled appointments with your health care providers. See your doctor at least every three to four months for regular check-ups if you are treated with insulin. See your doctor every four to six months if you are treated with other diabetes medicines or if you are managing diabetes with diet and exercise alone. More frequent visits might be necessary if your blood glucose is not controlled or if complications of diabetes are progressing. Make sure your health care provider checks your blood pressure and weight, and examines your feet and insulin injection sites. Have your cholesterol and triglyceride levels checked (lipid profile test) at least once a year. Have a dental exam every six months. If you have any signs of infection, go and have it checked by your doctor or health care provider. Try to manage stress as best as you can. You might think about attending a stress management workshop to help you learn better coping methods. If you are planning to travel, do discuss your travel plans with your doctor. Make sure to bring enough medicine and supplies with you on your trip. Keep medicines, syringes, and blood glucose testing supplies in your carry-on bag. Do not check in these supplies in case your luggage is lost. Continuous education for your diabetes will help to maintain and improve your health. Attend a diabetes class or schedule visits with your diabetes educator at least once a year. If you have a loved one who has diabetes, here’s how you can help. You want the best for your family members and friends who have diabetes. You want them to stay healthy and that means eating right, staying active, taking medication, monitoring blood sugar levels, and a whole lot more. You want to help your loved one do the right thing without nagging. That can be easier said than done, but the tips and list of resources below can make really helping a little easier. Tip 1 : Learn about diabetes. Diabetes treatment is improving every day. Understanding diabetes and how it is treated makes it easier to help your loved one. Attend a diabetes education class together. These classes are available at many hospitals. Tip 2 : Understand your loved one’s diabetes. Everybody is different and everybody’s diabetes is different. Some people take insulin, others take pills, still others take both and some people take no diabetes medication at all. People manage their diet, activity and blood sugar monitoring very differently as well. Some people have diabetes complications, while others do not. And some people feel lots of diabetes-related stress while others don’t. Asking your loved one about his or her life with diabetes makes it easier to be truly helpful. Tip 3 : Find out what your loved one really needs. Try asking the following four questions. Ask your loved one to answer as specifically as possible. What is the hardest thing about living with diabetes? What do I do that makes it easier for you to manage your diabetes? What can I do to help that I am not doing now? Tip 4 : Offer the help your loved one asks for. Take to heart your loved one’s answer to the last question in the tip above. Whether it is running to the drug store when your husband runs out of blood glucose monitoring strips, keeping snack foods out of the house to make healthy eating easier for your wife, or offering your friend some encouragement when she is feeling down, do your best to make your loved one’s wish come true. Tip 5 : Talk about your feelings. You don’t have diabetes, but anyone who is close to a person who does have diabetes is living with diabetes. The closer you are the more diabetes affects your life. How does your loved one’s diabetes affect you? What are your frustrations, fears and hopes? Talking about these feelings can help clear the air and put you and your loved one on the same side of the fence. That cuts down on nagging and increases cooperation. And that’s a good thing. Tip 6 : Get help. There is lots of help available for people with diabetes and those who love them. Many local hospitals also have diabetes education classes and diabetes support groups. If your family member or friend seems really sad, encourage your loved one to talk to a health care provider about it. Depression is more common in people with diabetes, and it’s a double whammy for them. When people with diabetes are depressed, they not only feel terrible, they usually have more trouble sticking with their diabetes self-care as well, and that means higher blood sugar and more health problems. The good news is this : effective depression treatment — medication or counselling — turns things around, helping people feel better and contributing to lower blood sugar levels. So if your loved one might be depressed, do everything you can to get help. 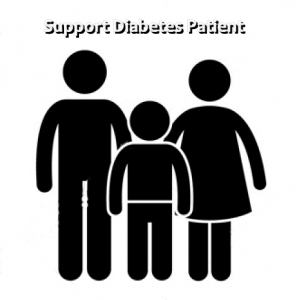 Being the primary caregiver for a person who has diabetes is not an easy job. A diabetes caregiver may be the one taking ownership of his or her loved one’s diabetes if the person with diabetes doesn’t or can’t. If you find it’s too much for you alone, talk with your healthcare provider or diabetes educator. They can help you with whatever you needed.